These five teenage boys are being praised as “hometown heroes” after they came to the rescue of an old man last month. 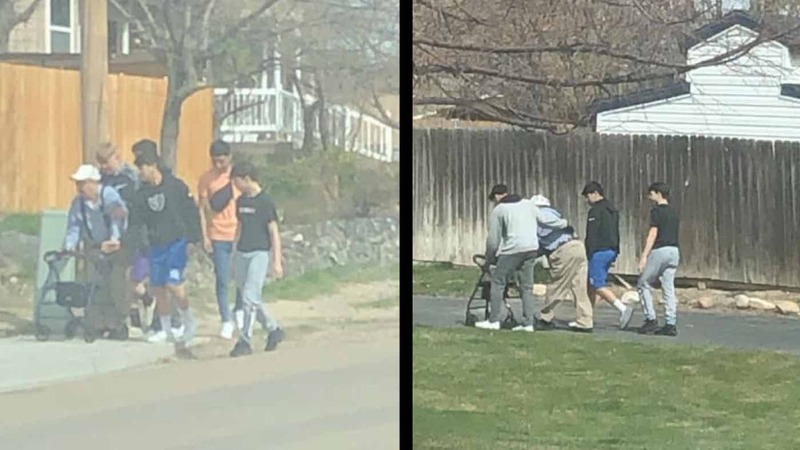 The young men from Caldwell, Idaho had been in the car on their way to play some basketball when they saw an elderly man fall to the ground. Isaac Hernandez, who had been behind the wheel at the time, says that when he saw the man hit the sidewalk, he immediately pumped the brakes so he and his friends could go and check on the senior. Upon helping him back to his feet and asking if he was okay, the teens insisted on helping him back to his house. After they had successfully escorted him inside, the young men cleaned up his wounds with some napkins and rubbing alcohol. Though the teens did not know it at the time, their good deed had been captured on camera by Erika Tovar. She had also been driving past the elderly man when she saw him fall in the rearview mirror. After she had turned her car around to check on him, however, she saw that the boys were already rushing to his side – so she snapped some photos of the exchange and posted them to Facebook, praising them for their kindness. Since the photos have been shared hundreds of times, local Caldwell businesses have showered the boys with gifts, food, and presents as a thank you for their kindness. But the five young men say that they were simply trying to do the right thing. However, the boys say that they have now developed a firm friendship with the man they helped, José Garcia. In the weeks following their first encounter, the boys have been paying regular visits to the senior at his apartment – and they plan on visiting much more in the future.